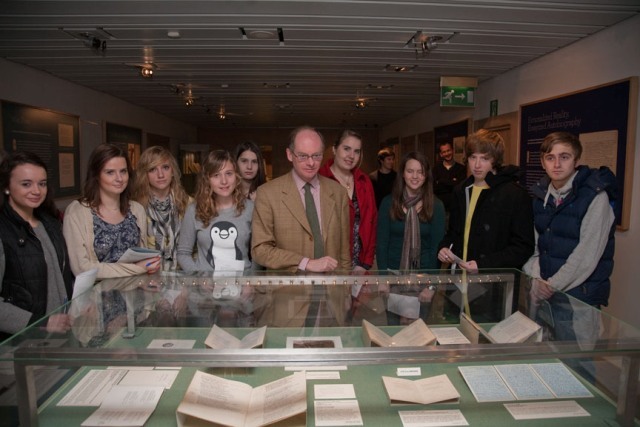 Wednesday saw a successful event in the Library’s inaugural exhibition schools liaison programme. The Library is keen to engage with local schools and the Sassoon exhibition seemed a perfect place to begin this new initiative, as his life and work are studied as part of English Literature, History and Citizenship curricula. 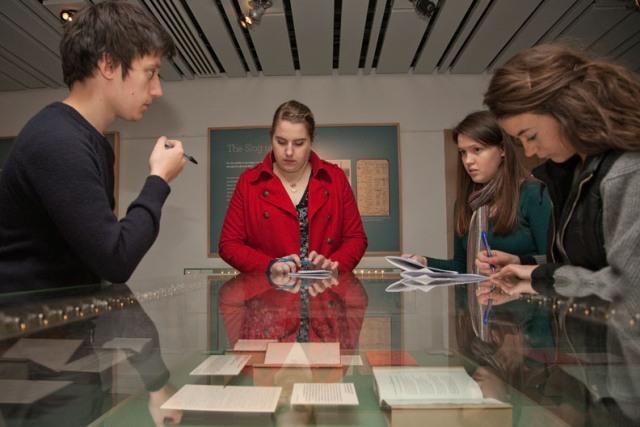 As part of their A2 module on World War I literature, a group of Year 13 pupils from The Bishop’s Stortford High School made the journey to Cambridge to see the exhibition and prepare some work on selected poems displayed within it. They arrived with a good background knowledge, having spent the term reading Pat Barker’s novel Regeneration and Sassoon’s Memoirs of an Infantry Officer, and a selection of his poems, but were fascinated to see the ‘genuine article’ in the exhibition cases. 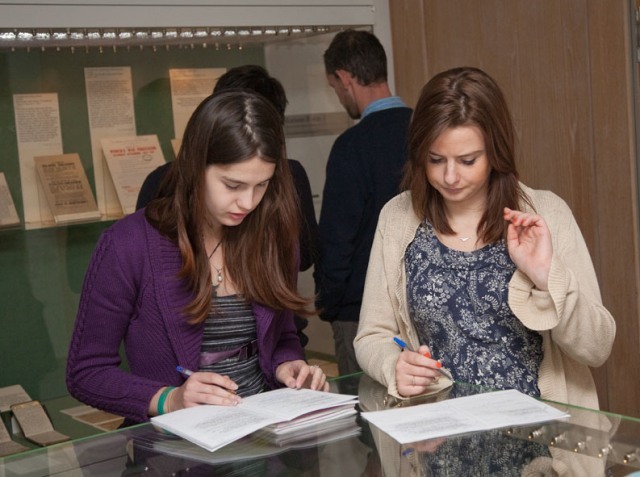 After a guided tour of the exhibition by the curator, they split into pairs, studying the exhibition materials to gain contextual information about the poems they had been assigned, before giving a new reading to the rest of the group along with an explanation of what they had discovered in the display. Several said they gained a whole new understanding of their poems by seeing, for example, Sassoon’s diary entries written around the time of the composition of Died of Wounds. Overall the visit was considered a great success, both by the teachers with the group but more importantly by the students themselves who felt they had seen more of the man himself than their previous reading had been able to offer. They rounded off their trip by braving the elements on a walk to Grantchester, fuelled by the prospect not just of a visit to the Rupert Brooke Museum, but of course also of scones and tea. A ‘guest post’ by Hannah Haines of the Library’s Entrance Hall staff. 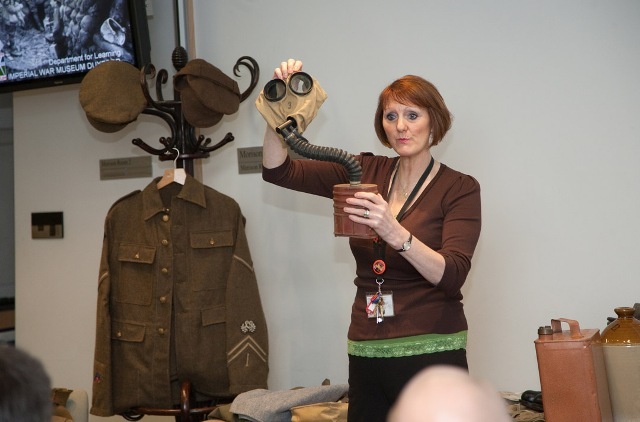 On Saturday 30th October, as part of the University’s Festival of Ideas, the UL hosted Robina Hodgson of the Imperial War Museum, who led a hands-on workshop, ‘Bombshells and Bedbugs’. 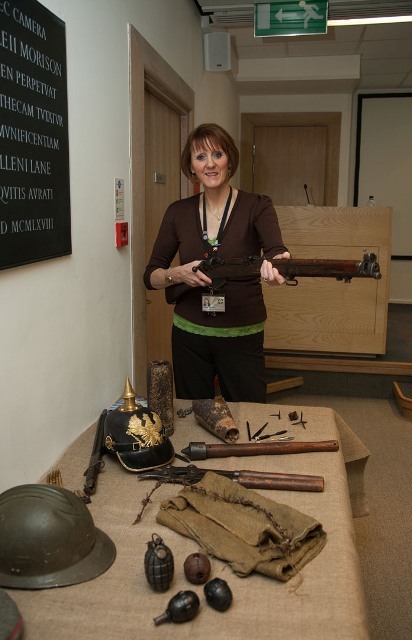 Using a collection of objects from the museum to illustrate her lively discussion about life in the trenches during the Great War, Robina demonstrated how to cut barbed wire, how to improvise trench weapons, and how to keep warm on a bitter night in northern France (with the assistance of a goat-skin jerkin and a tot of rum). Although she spoke about some of the worst aspects of trench life – the smell created by decomposing bodies, trench toilets and petroleum tea – she wryly promised to ‘watch what she said about Officer poets’, and was keen to show that life for the British Tommy in the Great War wasn’t always the badly-managed, unrelenting hell described in the most famous of the war poems. She emphasised that humour was ever present in the direst of conditions, showing a rum jar stamped with S.R.D. — an abbreviated form of ‘Service Reserve Depot’ according to the army, but popularly interpreted as ‘Seldom Reaches Destination’ — and considering the horrors of having a teetotal Commanding Officer who would withhold rum rations from his men. After the talk, encouraged by the selection of recruitment posters from the Library’s collection calling for them to ‘join in and do their bit’, visitors enthusiastically took the opportunity to examine the artefacts first hand. The Pickelhaube was particularly sought after, although those trying to squeeze into the jacket of the British uniform were disappointed to discover that shoulder width has increased substantially over the past century…. A very successful morning, and great to see library staff bringing their children along to join the activities and get involved in an event inspired by the Sassoon archive. Ivan Beauclerk Hart-Davies played cricket with Sassoon, and is named in a cricket scorebook in the first case. Gordon Harbord, Sassoon’s ‘greatest friend’ before the war, is listed among the riders in the race for the 1911 Southdown Heavy-Weight Cup in a notebook in the second case. David Thomas trained with Sassoon in Cambridge in 1915 and became a close friend; a letter from him to Sassoon and a photograph are in the third case. ‘Mick’ O’Brien, whose body Sassoon brought back to the line after the failed raid of 25/26 May 1916, is mentioned in his diary, also in the third case. Marcus Goodall‘s death is lamented by Sassoon in a letter to Edward Dent in the fourth case. Sassoon’s brother Hamo, killed at Gallipoli, was the subject of the poem ‘Brothers’ displayed in the fifth case. John Charles Mann‘s handwritten order to Sassoon at the Battle of Arras is in the sixth case. James Parry may have been the brother ‘Jim’ of William Emrys Parry, whose letter to Sassoon is in the eighth case. Wilfred Owen, some of whose poems are listed by Sassoon in a notebook, also in the eighth case. Who chooses the War poets? The War Poets of the Great War are today a group more readily identified than the Imagists or even the Georgians, to whose ranks several of them were conscripted (‘I am held peer by the Georgians!’ announced Wilfred Owen). How did Owen, Sassoon, Blunden, Rosenberg and Graves come to be so quickly accepted as the representative voices of their generation? What part have anthologies and their editors played in this process? 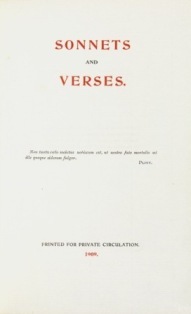 And now, after two decades in which concerted efforts have been made to broaden the range of war poets and the definition of war poetry, what impact might the newly acquired Sassoon archive have on public understanding of war poetry, almost a century after the Great War? The talk will take place in the Morison Room in the Library, and forms part of the events programme of the Friends of Cambridge University Library (http://www.lib.cam.ac.uk/friends/programme.html). Entrance fee for Friends is £2.50, others £3.50, and junior members of Cambridge University can enter free. There is no pre-booking for this event, but parties of six or more are requested to notify the Secretary of the Friends in advance: friends@lib.cam.ac.uk.